The official handing over of the keys took place at our brand new school building on January 22nd 2016. Founders of the school, governors and supporters watched while the ribbon to mark the entrance to the school was cut by Marina Gutierrez. Click here to see the article that appeared in the Brighton & Hove news. February 2016 - "A moving experience for 250 children starting at school’s new Hove home"
Click here to read the article that appeared in the Brighton & Hove news. Click here to read the artcile that appeared in the Argus. Click here to read the article that appeared in the Brighton and Hove News. 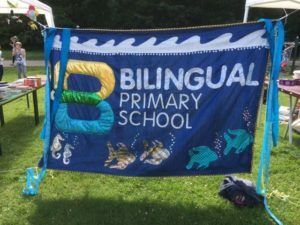 Our fantastic PTA organised a 'Summer Fiesta' in Hove Park on Sunday 3rd July which raised £6,600 towards play equipment for our new playground project.